Yep, another “end of the the year” post. comparison’s sake for 2008, last year’s totals are to the right. 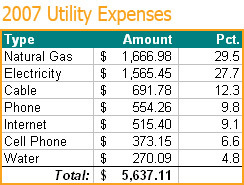 One value I know will drop in 2008 is the cell phone expenses. I dropped Verizon Wireless in favor of a pre-paid plan with Virgin Mobile in the Fall and that could lower my yearly costs to under $100.